Apparently, rare Beatles memorabilia is all the rage these days. Of course, there were the reissues and that box set, but then the widow of a Capital Records exec found an ultra-rare Sgt. Pepper's gag pressing. And now Canadian music experts Akim Boldireff and Aaron Keele of therecordguys.com have made a discovery of their own to add to the list of things zillions of Beatles fans will want but never have. According to a press release, the two recently obtained copies of, literally, one-of-a-kind versions of Beatles classics from a former Capitol Records pressing-plant employee who worked for Capital from the late '70s to the mid-'80s. 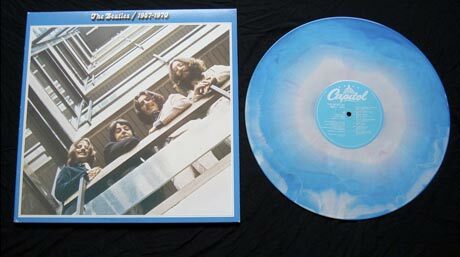 Said employee was a big fan of the Fab Four, so would make his own coloured vinyl versions of records when he had access to the plant after his shift. So, he did what anyone with access to their favourite band's music, coloured vinyl discs and a pressing plant would do: make his own private collection of coloured Beatles vinyl. (This is seriously the stuff Beatles fans' wet dreams are made of). So, what Boldireff and Keele have their hands on now are five records that are so rare experts don't even know how to value them. Below, from the press release, is what the two got their mitts on. You can check out the extremely awesome-looking records here, and the records will also be available for viewing at the Toronto Downtown Record Show on November 8 at the Estonian House Banquet Hall 958 Broadview Ave. The show runs from 11 a.m. to 4 p.m.; admission is $5.